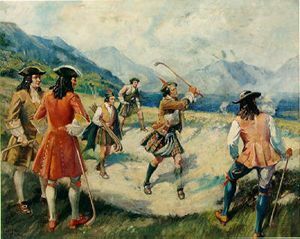 Most historians concede it was the Scots who introduced "golfe" to the world and no authenticated records exist to contradict this. Although the actual origins of golf are unknown, there is evidence St. Andrews, Scotland is indeed the cradle of the world's most popular game. The game of golf is at least 600 years old. There is plenty of evidence that golf was played at St. Andrews in Scotland before the founding of the University there in 1411, and there is sufficient indications to make a safe assumption that it was being played there in one form or another for a century before that. There have been claims to the game's origins by the French and the Dutch, but their cases are flawed. The Dutch cite the club and ball game of "Kolven"; the French point to a game called "Jeu de mail". Those games don't quite cut it since they lack one important element - the hole. Golf is alone in games in that the object of the game is to propel a ball across a course liberally littered with obstacles designed to prevent you from doing so, and into a hole. The hole is the vital factor in separating golf from other club and ball games. Some say that golf was first played by shepherds tending their flocks, passing the time by hitting rocks to targets with their staffs. Games would have developed between competing shepherds, playing across the grazing lands links and back to their village. In any event, it was only a matter of time before a pebble would roll into a sandy hollow formed when sheep had overgrazed the land while huddling for shelter against the icy winds along the shores. The unfortunate golfer would have found himself playing from the worlds first bunker. If only someone had documented the events of its earliest beginnings. bump and run was no substitute for an effective bow and arrow. In many parts of Scotland's East Coast, parishioners were constantly being punished for playing golf "at the time of the preaching of the Sermon". James IV also tried to stop the Scots playing golf, but eventually he took up the game himself. By 1501 his treasurer had paid 14 shilling to a bow maker in Perth to supply clubs. From then onwards there was a series of bills paid from the royal coffers for golf clubs and balls, and even for the king's lost bets. 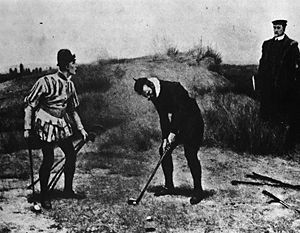 Interest in golf later expanded to England, where under the influence of political powers, land grants for links and other facilities were provided. Membership to these clubs and golfing societies carried a considerable amount of prestige. "Gentleman Golfers" were considered privileged groups indulging in a "legal, honorable, and respectful sport." It was during the 16th century that it became firmly established on the East Coast of Scotland and began to spread. By this time the game had gained respectability among high society and was even played by Mary Queen of Scots. She played golf with one of her attendants, Mary Seton, and in fact, the queen lost a match to her and presented her with a famous necklace. Mary Queen of Scots found herself in hot water for playing golf at Seton House shortly after the murder of her husband, Lord Darnley, in 1567. Many thought her enjoyment of the sport during the mourning period was unacceptable. Ironically, after so much resistance, it was the royal acceptance of the game that helped spread it throughout the country and beyond. Despite its popularity, it was another 150 years before efforts were made to bring any organization to the game of golf. In 1659, golf was banned from the streets of Albany, New York. This is the first known reference to golf in America. In 1687, a book by Thomas Kincaid, "Thoughts on Golve," contains the first instructions on how to make golf clubs. introduction of the first set of rules. The United States Golf Association and the Royal and Ancient Golf Club of St. Andrews currently govern the rules of golf. The "R&A" is the most widely accepted governing body throughout the world. The European tour is subject to the R&A. The USGA governs play in the United States. In 1857, The Golfer's Manual, by "A Keen Hand" (H.B. Farnie), was published. It was the first book on golf instruction. In 1861, The Professionals Championship was opened to amateurs, and the British Open was born. Old Tom Morris won the first tournament. 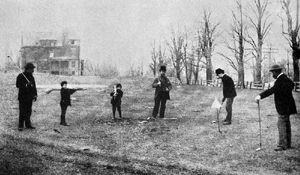 layout in 1888 at Yonkers, N.Y. Its founders were known as the "Apple Tree Gang" because of the many apple trees on their course. It was extended to 6 holes on a cow pasture. During the next few years numerous 6-, 8-, 9-, and 12-hole courses were opened in the East. The first 18-hole course in the United States, the Chicago Golf Club, was founded near Wheaton, Ill., in 1893. 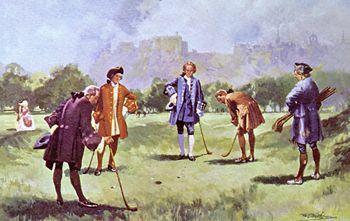 The latter part of the 19th century saw the major development of the game in Scotland, with the construction of many new courses. The arrival of the gutta percha ball, around 1880, was the single major factor in the explosion of the popularity of the game. In 1890, there were 387 golf courses worldwide. By 1895, the number had grown to 1280. It took 500 years to build the first 400 courses, and just 5 more years to triple that number. In the scheme of things, that explosion could be considered nuclear. During that period, earthmoving was a monumental task, and horsepower meant horses. There were 80 courses in the U.S. in 1896. By 1930 almost 6,000 courses had been built. The next two decades saw golf course construction come to a complete standstill. Between the stock market crash and WWII, golf courses did not have a chance. The 50's saw many golf courses destroyed to make way for highways and housing developments. In 1955, 600 courses were lost forever and only 200 new courses opened. 1890 also saw Hugh Rotherham's invention of the hypothetical score of an expert golfer who plays perfect golf on every hole. He called it a "Ground Score". Dr. Thomas Brown, honourary Secretary of the Great Yarmouth Club, christened this perfect golfer the "Bogey Man," after a hit song of the day, and declared his score a "Bogey." Since the improvements in length achieved by better balls and equipment, the holes got "shorter" and the perfect score was called Par and a Bogey became one over par. Copyright 2002-2009 All Rights Reserved.